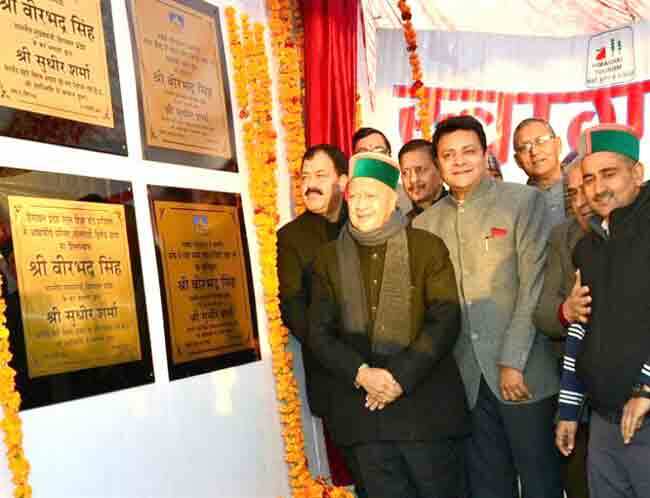 Himachal Pradesh Chief Minister, Virbhadra Singh has dedicated and laid foundation stones for about a dozen developmental projects worth 57 crore of rupees in Dharmashala constituency. He also laid foundation stones of the proposed indoor sports complex and tennis court at Sidhpur and the ambitious smart lighting system in the Dharmashala Municipal Corporation. The Chief Minister laid foundation stones and dedicated 10 projects from a single site in the old D.C. complex. On this occasion, he dedicated the newly constructed building of Primary Health Centre, Khanyara worth Rs.77.49 lakhs and Sargandi Nallah Bridge on lower and upper Chetaru at a cost of Rs.127.49 lakhs, building of P.H.C. Bagali at a cost of Rs.69.88 lakhs, girls hostel in the premises of Govt. Degree College, Dharamshala at a cost ofRs. 70.78 lakhs, Secrecy block in the premises of H.P. Board of School Education at a cost of Rs.4.13 crores. On this occasion Urban Developmental Minister Sudhir Sharma, Chief Parliamentary Secretary Jagjivan Pal, chairman KCCB Jagdeesh Siphiya, chairman H.P. Board of School Education Balbir Tegta, Vice-Chairman Kewal Singh Pathania, former minister Satya Prakash Thakur, former M.L.A. Surendra Kaku and Bodh Raj, DC CP Verma, SP Sanjiv Gandhi were also present.